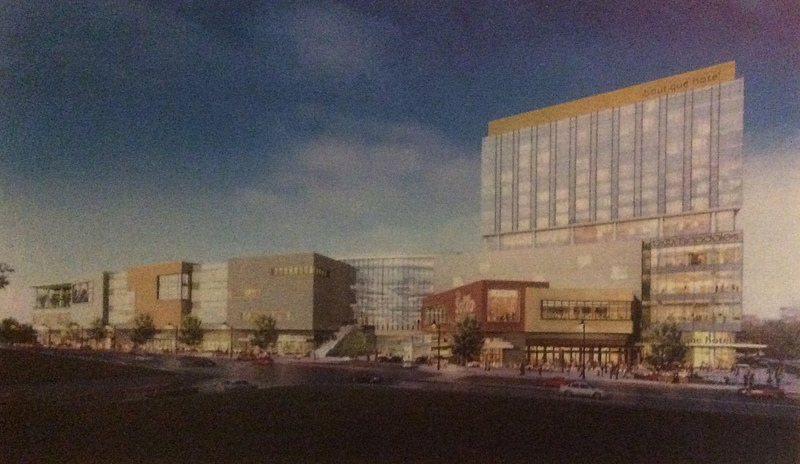 The most recent artist’s rendering of The SoNo Collection, from the southwest. Updated Thursday, 12:30 a.m., with minor editing, photo and video of Wednesday morning LDA signing. NORWALK, Conn. — General Growth Partners (GGP) is looking to begin construction on The SoNo Collection this summer, GGP Senior Planner Doug Adams said Tuesday. His optimistic comment came after Mayor Harry Rilling announced that, Wednesday (today), the city would sign the reformulated Land Disposition Agreement (LDA) for GGP’s property at the intersection of Interstate 95 and West Avenue and after the Common Council unanimously agreed that GGP has met the conditions defined in the revised Concept Master Site Plan (CMSP) in October. The only negative note expressed during the Council meeting came from Councilman Doug Hempstead (R-At Large), mainly about the screening of the eastern side of the mall’s proposed parking garage. Neither the mall’s public realm space nor the “activation” of North Water Street under the proposed overpass are part of the LDA. The Council will be asked to sign off on those plans later. Hempstead asked Redevelopment Agency Executive Director Tim Sheehan about the parking garage. Hempstead said he was glad GGP was collaborating with the city, Redevelopment and The Cecil Group. “Wish we had done that a lot sooner, probably would have shortened this up a few months,” Hempstead said. The Council has an obligation to follow up on the wishes of the last Council, he said, in regards to public realm, the activation and the garage. Council President Bruce Kimmel (D-At Large) said he wasn’t micromanaging, but the plan for “green” on the side of the garage was difficult to grasp. Sheehan said the materials to be used would be made public soon as part of design review. Kimmel asked Sheehan if there would be 3-D renderings of North Water Street. Kydes said they would be available at next month’s Planning Committee meeting, or the meeting in March. The garage’s “eastern façade” faces Oyster Shell Park, Adams said after the meeting. That’s what people would see from the train, the highway and the park, he said. “We are working on that design with the design review folks. I would think we are probably 30 days out from having that,” Adams said. Renderings have shown a planted wall, he said. Is he satisfied with the progress? “We would always like to go faster, but we like that we got this approval of the conditions and we are hopeful that we get through Planning and Zoning and design review as quickly as possible because we are ready to break ground,” Adams said. The Zoning Commission’s review of the project was delayed a month when GGP revised its plans, eliminating its proposed tunnel under West Avenue, changing the building’s layout accordingly and adding a rooftop plaza. 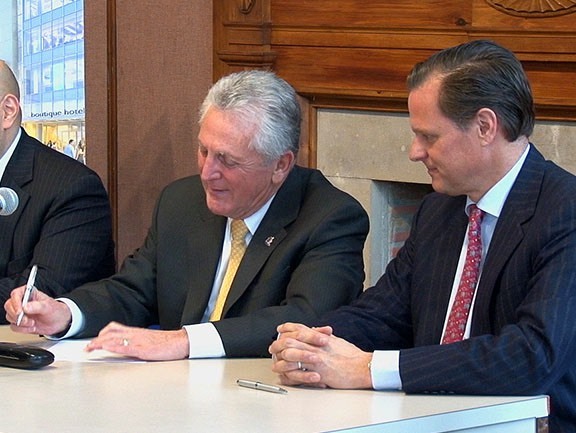 GGP’s Doug Adams, right, watches Norwalk Mayor Harry Rilling sign the Land Disposition Agreement on Wednesday to allow the mall developer to move ahead at the West Avenue property.